Yes, the end has finally come! 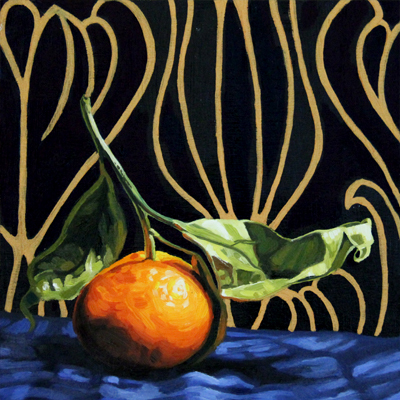 I had one more painting session this past weekend and voila I have completed Satsuma Blues! I am crossing my fingers that it will be nice and dry before I drop it off on Friday. After adjusting the photo in Photoshop I realized that I had forgotten my signature! Done. Now it it just needs to dry. As mentioned in my previous post, I only had a few areas to tweak. I fixed the stem, which I smudged while trying to paint the gold lines. I also worked on the leaves, adding more transitional colours and highlights. I added pure Hansa yellow to the lighter areas of the satsuma. I went over the gold a second time to really bump it up and make it opaque. I didn’t end up redoing the one side. It worked for me on my second viewing. The cloth got reworked and I decided NOT to add embellishments. I figure the gold background design was more than enough bling! Time to move on to the next painting! I still need to finish Vermillion ablaze…the nasty fly is still missing. I have a few commissions to complete within the next few months and I would like to paint a new painting for a Juried Show in May. THAT will be my next Painting Process Blog.